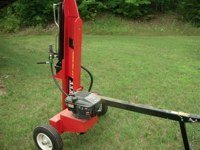 A hydraulic log splitter is capable of splitting large amounts of firewood with ease. These machines can be used to split both hardwood and softwood, along with pieces containing knots which are often difficult to split manually. Hydraulic splitters are typically powered by a four stroke gasoline engine. You can also purchase a model that hooks up to a tractors hydraulic system, allowing it to be powered by the tractor. Hydraulic oil contained within the machine is pumped though a valve that is controlled by the operator. This pressurized oil operates a hydraulic cylinder that splits the log. Models containing a two stage pump allow the hydraulic cylinder to operate a two speeds. This decreases the time required for the hydraulic cylinder to cycle allowing you to split more wood in less time. Most models have large pneumatic tires and a trailer hitch that allows them to be to be towed on the roadway. The splitter will tow easily down the roadway but they seem to bounce around quite a bit due to how light the unit is and the narrow wheel base. I typically try to avoid towing my splitter over long distances. If I have a long way to go I load the splitter in a utility trailer which tows much better. Look for a model that spits both horizontally and vertically. Most of the time you will use the splitter in the horizontal position because in my opinion it's quicker and easier. For larger logs which may be too big to pick up, switch the splitter to the vertical position. This prevents you from lifting the large logs onto the splitter. 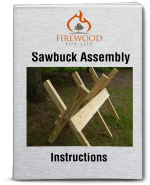 Without the vertical option, you will only be able to split logs that can be lifted on to the splitter. Hydraulic Log Splitter - Buy One? 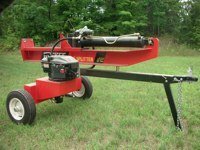 The splitter pictured above is a Huskee 22 ton log splitter with a 6.5 horse 190 cc Briggs and Stratton engine. The 22 ton is one of the smaller hydraulic splitters you can buy. I have owned this machine for at least 6 years and I have used it to split A LOT of firewood. So far I have not found a single piece of wood this splitter could not handle. Do I like it? I love it! Most people will agree that once you own one you couldn't live without it. They make processing a full years supply of firewood much easier than trying to split it by hand. However, they are an expensive investment. They are also loud machines that require the purchase of additional gasoline. Most rental companies will rent you a hydraulic wood splitter for the day. Renting one could give you a better idea whether or not you would want to purchase one.